The cost of EpiPen has shot up more than 500 percent over the past 10 years, but according to Consumer Reports, there are other lower-cost options for people who need those injections to stay alive in an emergency. As kids head back to school, along with backpacks and lunch bags, some will bring a life-saving epinephrine auto-injector, like an EpiPen. While the number of options and availability of these devices has improved, they can still be expensive, especially since families often need multiple injectors. "There are four different epinephrine auto-injectors available," said Ginger Skinner, of Consumer Reports Best Buy Drugs. "They all work slightly differently but contain the exact same drug in the same dose. What's best for you will really depend on if you're insured and what's covered." 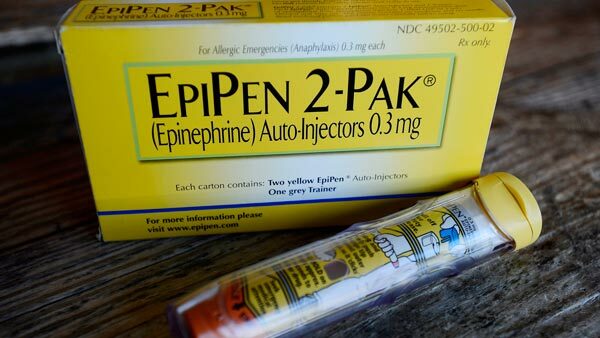 Mylan started making a generic version of EpiPen in December, with a retail price of $300, and there is no difference between the two versions of EpiPen. Mylan offers some discounts, and if you're uninsured or underinsured, you may be eligible for free EpiPens through its patient assistance program. you're uninsured, you may pay either zero or $360, depending on your household income. Another option is generic Adrenaclick, which has a special deal with CVS pharmacies for $110. But a manufacturer's discount coupon gets the price down to $60. "Any of these devices could save your life in an emergency," Skinner said. "But it's really important to understand how the device you're prescribed works." To avoid potentially deadly mistakes or injuries, Consumer Reports strongly recommends asking your doctor or pharmacist for a training with your new device. Consumer Reports says another epinephrine option called Symjepi could hit the market before the end of the year. It's expected to be a pre-filled syringe, not an auto-injector like the others, and it could be a good lower cost alternative.